Members of the Rail, Maritime and Transport union (RMT) will walk out today, Wednesday and Friday on Arriva Rail North (Northern), South Western Railway (SWR), Merseyrail and Greater Anglia, and on Monday on Southern, causing disruption to services in the first full week back to work after the festive break. Talks were held between the union and SWR and Arriva, but they ended without any breakthrough to the long-running row over staffing, driver-only operation and guards. Northern, which operates routes in Yorkshire, said it will run around 1,350 services on strike days, more than half its normal timetable, with most running between 7am and 7pm. A spokesperson for Northern said: “As the overall number of trains running will be reduced, we do expect trains and any replacement buses we operate to be extremely busy. Please allow extra time for journeys, plan carefully and consider whether travel is necessary. Northern passengers can use their tickets on Arriva Bus services, including Yorkshire Tiger, on each of the strike days to make journeys they would otherwise have made by rail, the company said. Northern customers with Advance Purchase tickets are also advised that their tickets will be accepted on the strike days by alternative operators Arriva Trains Wales, Cross Country, East Midland Trains, TransPennine Express, Grand Central, Hull Trains, Virgin Trains East Coast. Virgin Trains West Coast will accept Northern Advance Purchase tickets on Wednesday and Friday, and customers are advised to travel as close as possible to the original booked train times on these days. Richard Allan, Arriva Rail North’s deputy managing director, said the company was committed to investing in new and updated trains, better stations and faster journeys. Amended timetables for Northern Passengers are available at www.northernrailway.co.uk/strike. Amid the strikes elsewhere in the country and SWR plans to run more than 70 percent of its normal weekday service of 1,700 trains, although there will be rail replacement buses and arrangements to have tickets accepted on other train companies. Greater Anglia said it planned to run a normal service with no alterations. Merseyrail will run a reduced service, mostly between 7am and 7pm, with a break during the middle of the day and no trains on the Kirby, Ellesmere Port or Hunts Cross lines. Arriva Buses will accept Merseyrail tickets on all three strike days covering the Northern and Wirral lines. Southern, which is facing its 39th RMT strike on Monday, said it planned to run a normal service on most routes, but advised passengers to check for any last-minute changes before they travel. 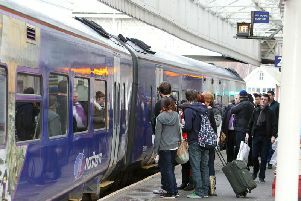 Angie Doll, passenger services director for Southern Railway, said: “The RMT’s action is especially regrettable as the leadership announced this strike just hours after we had invited them for talks in a bid to end the dispute. Andy Heath, Merseyrail managing director, said: “These latest strikes are part of a much bigger picture of UK-wide strikes by the RMT which, unfortunately, local passengers are falling victim to. “I would like our passengers and business leaders to be aware that these three strike days represent a high stakes strategy being adopted by the RMT union with no consideration of the impact on the city region. “These three days of strike action demonstrate the RMT’s disregard for the impact their actions have on our passengers and damage to the economy of the city region. Andy Mellors, SWR’s managing director, said: “We are sorry that our passengers will once again suffer due to this unnecessary strike action. “Our passengers just want to get to work in the morning and back home on time in the evening to see family and friends. “We have repeatedly guaranteed that no one will lose their job and that we will roster a second person on board every train. RMT general secretary Mick Cash said: “Every single effort that RMT has made to reach negotiated settlements in these separate disputes with the different train operating companies over safe operation and safe staffing has been kicked back in our faces and we are left with no option but to press ahead with the action. “No one should be in any doubt, these disputes are about putting the safety of the travelling public before the profits of the private train companies. “This suspension of normal industrial relations by the employers has to end if we are to make progress towards a solution that guarantees safe rail travel for all. “RMT is in no doubt that it is the dead hand of the minority Tory Government that is interfering in these disputes and that their influence is a factor in preventing the union from reaching negotiated settlements. “With the fare increases kicking in this week it is outrageous that Theresa May and Chris Grayling are happy to stand aside and cheer on overseas rail companies that rip off the British passenger with eye-watering fare increases to subsidise their domestic transport operations while throwing the guards off our trains. A Department for Transport spokesman said: “Despite the best efforts of the RMT to cause misery for passengers, the train companies will keep passengers moving with the majority of services running as planned. “This dispute is not about safety and no-one is losing their job - employees have been guaranteed jobs and salaries for several years. “At Southern Rail, where these changes have already been introduced, there are now more staff dedicated to working on trains than previously.